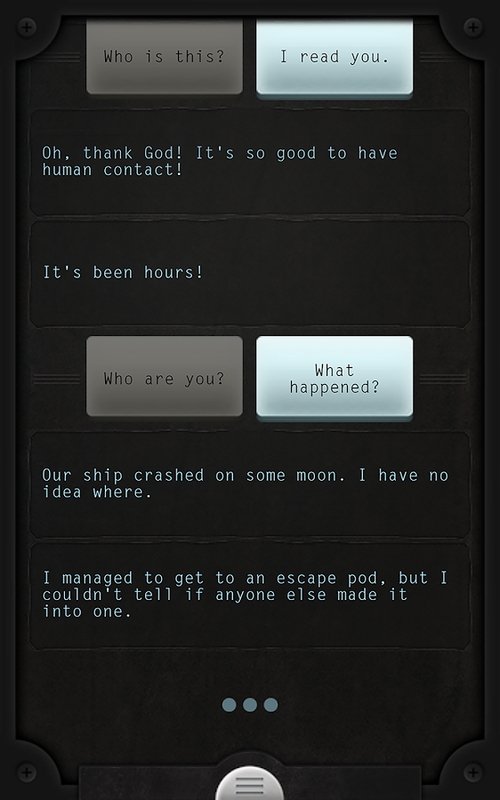 In Lifeline, you act as a texting buddy for a college student stranded on a moon after an unexpected crash has separated her from her shipmates (i.e., you act as her Lifeline. Apt title!). The character you assume has no intricate knowledge of the circumnavigation of unknown moons so the only help you can hope to provide is emotional. You help Taylor (the aforementioned college student) decide whether to hide or explore, scavenge or rest, save or abandon. You haven’t much to go on other than Taylor’s rudimentary descriptions of her immediate surroundings, and a few suggestions she occasionally lobs at you throughout the course of the game. Lifeline happens in real-time. So you must wait for Taylor to execute actions (some of which take several hours) in order to see how your guidance has affected her. It’s an interesting take on a choose your own adventure style game in which you converse with the main character and advise them on steps to take rather than roleplaying as the character yourself. The real-time aspect adds another dimension to the Taylor character and the game as a whole. Taylor feels realer, in a sense, because of her actions “take time.” You can’t plow through Lifeline and its many endings in one binge session. The story is scattered throughout the span of a few days, interjecting itself into your everyday life. The division between the story’s time and your real life are blurred. In this way, the story unfolds much like a texting drama unfolds between real friends. Save for the fact that instead of talking about the latest Twitter battle between two friends or arguing whether frozen yogurt or ice cream are the tastier of the frozen treats, you’ll be advising Taylor how to survive radiation or whether or not to leave her fellow crew mates for dead. Lifeline also benefits from incredible writing. I was genuinely surprised by the storytelling, the realistic yet fun dialogue, the fleshed out character and story arcs, until I found out that the writer behind the mobile game was none other than talented Dave Justus (of The Wolf Among Us team). This kind of game would not work without a superb story, or rather, stories when you consider that the branching narratives. Fortunately for Lifeline, the writing succeeds on all levels. Taylor is relatable, she’s strong yet vulnerable. She and her story are compelling, which is an absolute necessity for a game that forces you to forget about it for hours at a time. As Taylor’s Lifeline, you have immense power to shape her time attempting to survive on the moon. The story continually branches off into different directions based on your responses to her, making each decision satisfyingly difficult to make. The choices aren’t easy or obvious either, which is a problem that plagues many otherwise well-written choose your own adventure games, but the game isn’t arbitrarily punishing either (a la Hitchhiker’s Guide to the Galaxy). Lifeline is a rare game, a mobile game that uses its minimalism as a strength. The texting buddy twist breathes fresh air into gaming’s oldest genre. It’s a mobile game actually worth its affordable price tag. Tired of interactive fiction? Go buy it anyway. I did, and I was not disappointed.